I had so much fun at my first SDP convention. I can see why people return year after year. 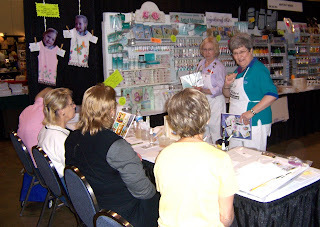 The painting classes were great and the trade show had much to offer! 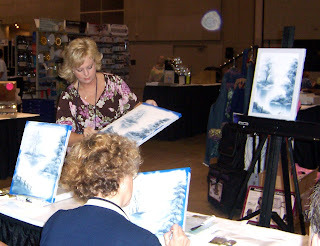 I was helping out in the Martin / F. Weber booth and my good friend Patty Reichenbach, who manages the trade shows and for Weber and demonstrates (Queen of) Bob Ross oil painting, asked me to put together a fabric painting kit for the show and it turned out to be a lot of fun. I thought I would share a few pics with you guys! How about painting royalty? 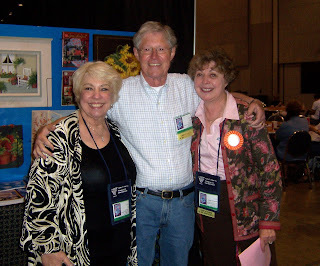 This great picture is of Ros Stallcup, Stan Brown and Sue Schewee! I LOVE THE WAY THESE GIRLS PAINT! Talk about talent! 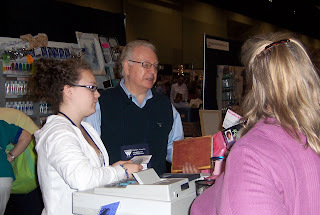 Jane and Bard demonstrate for Sue Schewee in the Weber booth and man, they are the BOMB! I love these girls. Patty calls them Chip and Dale, but we started calling Barb "Cougar" on the trip, but I won't bare the details behind that! LOL! This girly won the big basket at the end of the show. I could pinch myself for not remembering her name, but she was a sweetheart and LOVED all the goodies. She is standing with Patty who's looking pretty darn cute in this picture! Ok - talk about crowd control! This is a picture of Patty's make-it-take-it, where you can sit down in the booth and actually paint this with Patty in about an hour. Not one single painting looked bad, they were all gorgeous and people were standing and waiting 3-deep behind each chair to do this with Patty. 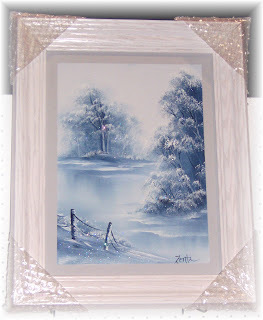 This painting is done with the Bob Ross method and she only used two colors....plus....yeah baby....some GLITTER! That's all you have to tell me and I'm all over it! 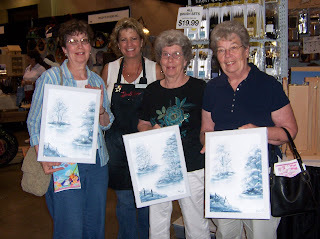 Now these ladies were all sisters at the show...look how great their paintings turned out! This cutie pa-tootie is Ashley Knowles. She is Dawn Knowles' daughter, creator of Interactive Artist Magazine, and grandaughter of Dennis Kapp, CEO of Weber, pictured below with Ash. I love this kid, she's all over the register and already better at sales than I'll ever be! Oh, by the way, I will be featured in Interactive Artist Magazine in August and painting the jacket that is at the bottom of this blog! Ashley and Dennis chatting with the happy customers! 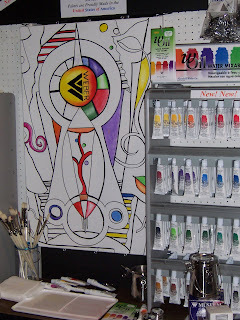 These are the new wOils, oil paints you can mix and clean with water. 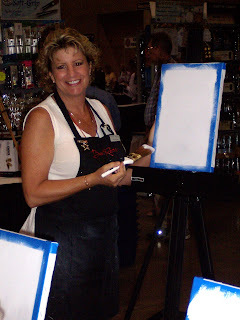 Patty put up that rockin' canvas so everyone could paint with the new paints and give them a try!! Patty rocked my jacket display. 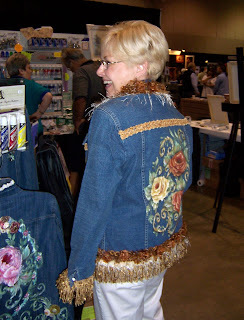 She brought this great garment rack and I took several painted jackets that we hung for people to see the technique and bling/embellish factor. The Angela Anderson Fabric Painting kit made for Weber is hanging to the left of the rack and on the rack in the picture below. I was very humbled by the response to the jackets. I had a lot of positive feedback and people really seemed to enjoy them. I sold out of the kits on the second day, God is good and I am blessed to be able to do something I can share with others. Thanks to Patty for this great display! 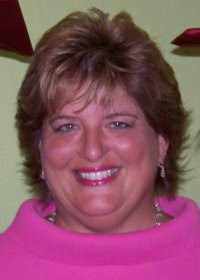 Now this beautiful angel is Sandy Braun. Sandy saw my jackets the first day and loved them. She just had to have this one and I can see why. She looks great in it! 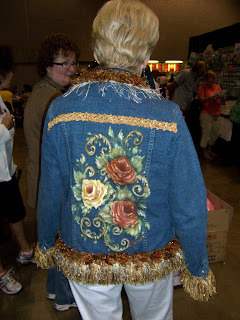 Plus, Sandy wore this the second day of the show and said she had so many compliments on it. 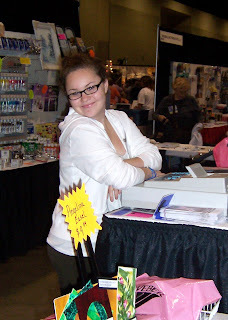 She was working with Bobbie Takashima and in Jo Sonja's booth. Sandy is probably the reason the kits sold out truth be known. 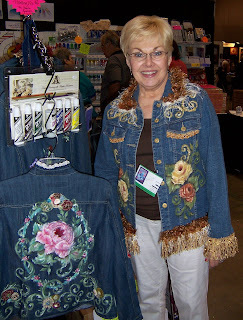 Thank you Sandy, you really gave me a confidence booth and the jacket looks fantabulous on you! As a reminder, this is the jacket that I will be doing a video demonstration of in the August issue of Interactive Artist Magazine. If you haven't been to this site, it's an online magazine with a great subscription price for videos, downloads, online gallery and more! Please check it out and let me know what you think! Well, I think that just about catches us up for SDP. I enjoyed seeing some familiar faces and meeting lots of new ones. Thanks to MFW and Patty for giving me the opportunity to work the show. It was amazing! 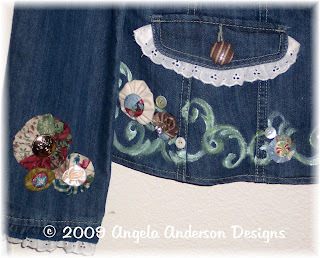 Don't forget to be my friend on Facebook at www.facebook.com/AngelaAnderson and join the fan page for lots of updates, probably some worth looking at, some not (he-he), at www.fbook.me/AngelaAndersonDesigns. Hugs and God bless you and your brushes!! Well, I have my passport to fun and I am Peoria bound tomorrow! 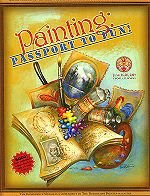 I am so excited to attend my first SDP (Society of Decorative Painters) annual convention. You can read about the society and more about the conference here. 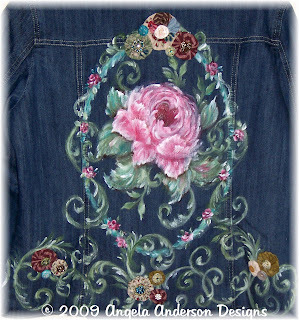 I have completed the fabric painting kit (Country Rose Denim Jacket pictured below) for Martin/ F. Weber and here is a picture of the end result. 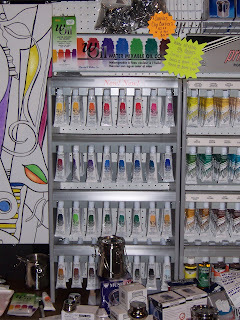 This packet has 6 tubes of Prima Acrylic Colors and Prima Fabric Medium. It also has a brush and chalk for sketching on fabric. 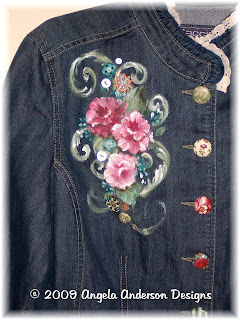 The disc that comes with it contains a .pdf of full instructions, step-by-step color photos and patterns, everything you need to paint this fun jacket. Wish me luck! 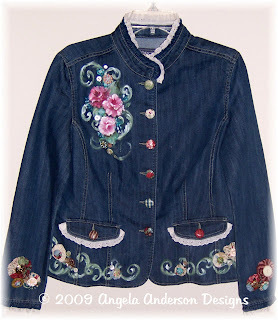 I hope it sells well and here's reminder pics of the jacket, but there are more pics in an older blog you can look back on! I will try to do some mobile uploads to Facebook and take lots of pictures for a post show blog. I hope to see some of you there! Hugs and God Bless Your Brushes! The other day my niece came over and she helped me organize my craft supplies in my studio. It's a huge task...I'm pulling everything out so I can redo the studio this year. It was one of those days where her sisters were doing other things and her Mom thought she might want to do something to pass the time, so she came over! Anyway, I thought cleaning and organizing craft supplies would be something "fun" (ha-ha) we could do together. Surprisingly, it actually did turn out to be quite fun and Audrey was a wonderful help. I thought surely she would rather be doing something else, but she hung in there as we put stamps and thread and buttons away, organizing as we went. I promised as we came across things that I didn't need any longer that she could have them. We started with a small box and it was quickly filled. We then switched to a larger box and filled it. We finally ended up with this larger box and a bag of goodies for Audrey and we made a lot of progress working together. I kind of explained to her what I was giving her, but told her she could use these things any way she wanted. 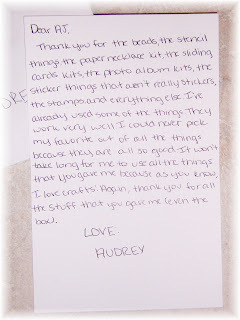 Audrey is very creative, I knew she'd come up with several ideas from these supplies. To my surprise and amazement, I received this thank you letter (hope you can read it) and this beautiful work of art from Audrey within just a few days of our time spent together. 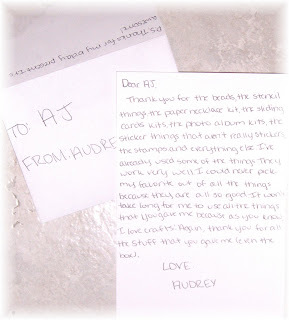 Audrey is only 10 years old. 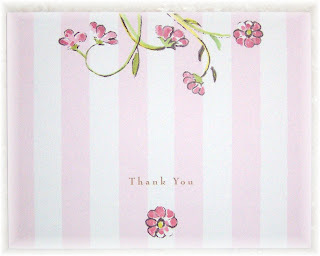 I was so touched by her detailed thank you note, what a sweetheart! I wanted to share this for the obvious reasons, but the not-so-obvious reasons too. Sometimes we get soooo busy and forget that just a couple of hours together with a child can mean so much to them. Although she said thank you when she left, I really had no idea until I got these wonderful things just how thankful she was. Audrey will obviously enjoy her art supplies for many months and I have a great suspicion that unlike her Aunt, she won't be giving any extras away. 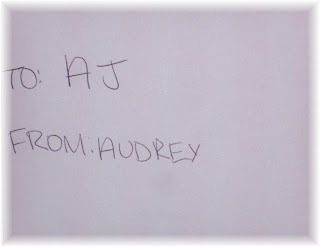 Thanks Audrey, it seems I should have been the one to send the thank you card! This is truly what it is all about! You make a difference whether you know it or not! Bev Davis Makes Great Use of a Project Idea!! 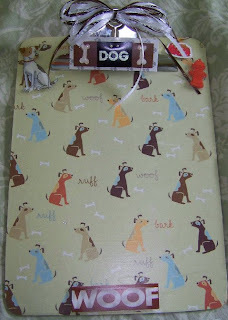 Back in May, I posted a link on the Angela Anderson Designs Facebook Fan Page to a fun project using clipboards. 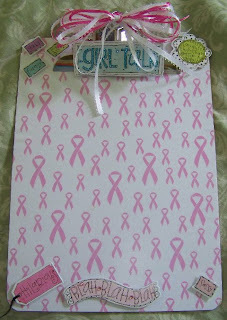 This link was to Jo Pearson of Where Creativity Happens (Michaels) and showed a video of her making this fun little clipboard project. 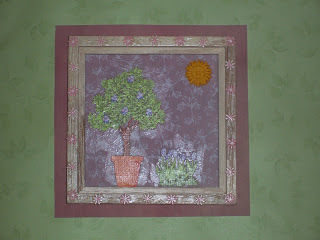 This is the project that inspired a good friend of mine, Bev Davis, to make her own! This is Jo's Project which I have provided the link for!! 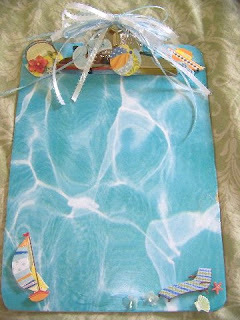 So Bev was so inspired, that she created these fun clipboards that have her own twist! They are adorable. We love them!!! I love dogs and this one is first because it's my favorite! Great job Bev!! This one is especially meaningful and truly a great idea, way to go Bev! The strength of women always amazes me, great project! Look at this! Makes you want to dive right in! Wouldn't this be cute for a lifeguard!! Then, that sweet Bev! 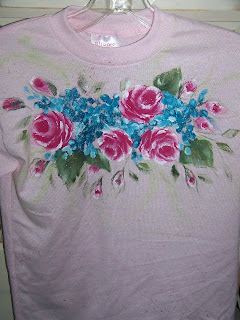 She got to painting a shirt that was inspried by a few of my designs, but again, has her own flair and beautiful twist on it! Aren't these roses gorgeous!! Great job Bev! where she has some great paintings and ideas! Be sure to click on the Facebook Fan Page link and become a fan so you too can find some great ideas! I would love to show your pics in an upcoming blog! And don't forget to check out Jo Pearson, Where Creativity Happens! That girl is always up to something crafty and fun! There are full videos you can watch with project sheets, try them yourself or throw a craft party and create with your friends! 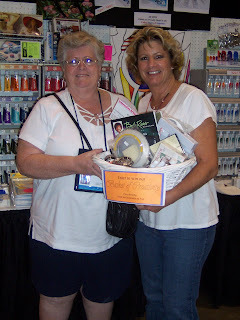 Hugs and God Bless You and Your Brushes...and thanks to Bev for this fun blog! Hey there! 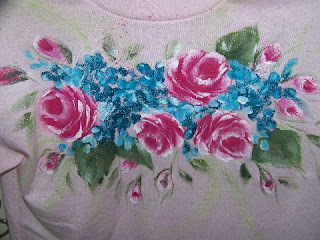 Well, I have been back at it, creating more "Diva Duds,"
just can't stay away from the fabric painting for too long! so if you're there, please come visit me in the Weber booth! 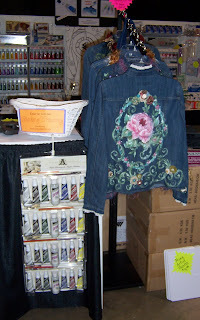 So, what I used Weber's Prima Acrylic Colors and their Fabric Medium to paint on this denim jacket. I am almost done with the instructions and they will be step-by-step photo instructions - always helpful to artsy types, right! very simple way to take your Diva Duds to the next level! I know this design looks advanced, but my photo instructions make it easy to follow. 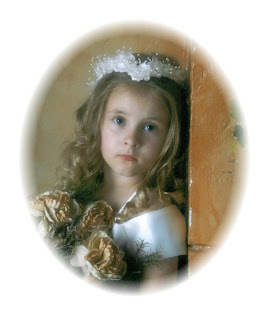 I will launch the pattern at the show in SDP, but will then make it available as an e-packet on line. Ok, so then you're saying what are those little trinkets all over the jacket. 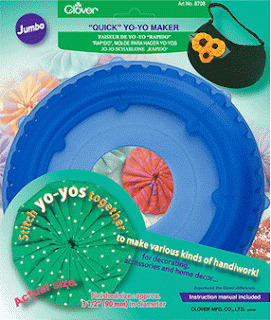 Well....with my same cute fabric and these wonderful Yo-yo Makers by Clover, I was in business! I knew with the help of my Mom, she is a sewing genious and all-around wonderful helper, I could add a fun quilter's look to the jacket! Clover ROCKS! 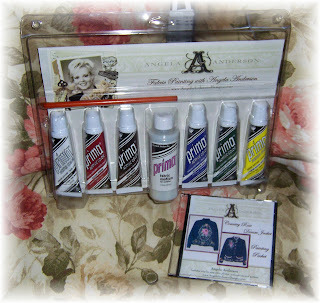 I love their collection of tools for embellishing fabrics. Check Clovers Great Tools Out! but you can buy them online at the Clover website. 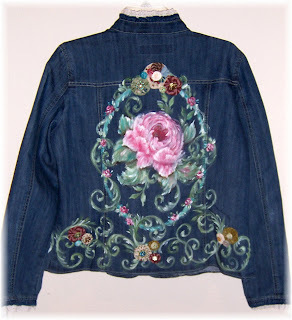 Mom then sewed the eyelet around the collar, pockets and sleeves, but you know what? You don't even have to sew because the rest of the embellishments were put on with Fabri-Tac, my absolute FAVORITE glue for painting on fabric! I could have glued the eyelet on too and would have had to if it wasn't for Mom - thanks Mom!! 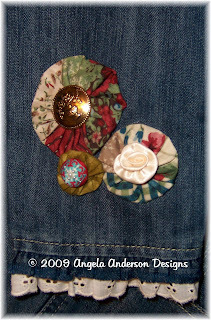 In these pictures, you can see some cute buttons I hand-sewed to the Yo-yos. I found some of these buttons at Jo-Ann, a Vintage collection by Blumenthal Lansing Co. 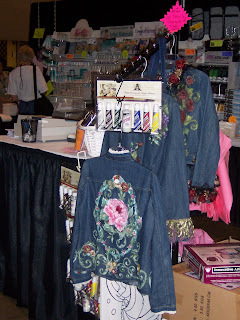 I also took some scrapbooking fabric covered embellishments called Sticthed Brads by K and Company - they had several kinds. I just used my clippers to clip the brads off and my Fabri-Tac to glue them to the Yo-yos and some directly to the jacket. I hope you like it, would love to hear some feedback. I have designed several jackets this year, but have not yet put together the instructions. I need to make some e-packets! I guess I think I'm busy or something (wink-wink)! !